My sons are home from college. I’m just here enjoying their company. Great challenge and a great opportunity to dust off our punches! Beautiful page! The pictures are spectacular! I haven't blogged in years. received Melody's layout and have forwarded it on to Lolis. I just want to let you know that we have a death in the family. I tore a meniscus several years ago, but no broken bones. I couldn't help myself! I had to do another Hello Kitty page! 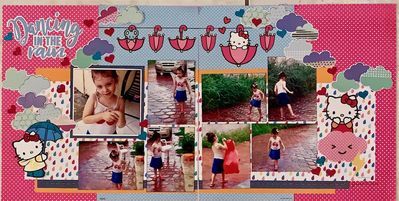 My goddaughter, a couple of years ago, playing in the rain.